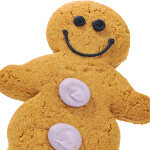 Gingerbread to be served this summer for the T-Mobile G2? It looks like owners of the T-Mobile G2 will finally be receiving their Gingerbread this summer according to a story in ComputerWorld. The report, written by JR Raphael of Android Power, said that Raphael had spoken with a representative of HTC who told him that the G2 is on track for a Q2 upgrade to Android 2.3. It is somewhat surprising that so much time will have expired between the launch of Gingerbread last December, and the eventual date that the T-Mobile G2 receives the software upgrade. After all, the handset runs stock Android which shouldn't make it too difficult to come up with the upgrade. What exactly will Android 2.3 bring to the G2? How about improved battery life, faster speed, an improved keyboard and a better cut and paste system. And if that is not enough to make you happy, Google is said to be working on Android 2.4. Literaly cannot wait... This just seems like a pretty big strech of time. I'll probably just root my phone because im not gonna be able to wait. Im just happy its gonna make it to the G2 after all. Does this mean the mt4g, will be get some bread soon too? Frickin hope so. :O just when i switched my phone -___-. (I know its GSM/SIM card phone so you can do it yourself but u need a "4G" Sim card to do it and i dont have mine no more) D; I regret it!